Today, we live in the world of Internet where each and every part of life is up for show online. We are under constant surveillance by the Government as well as other parties. In the midst of all these Apple’s new iPhone has hit the markets. In addition to its numerous other awe-inspiring features, the new iPhone X comes with the widely celebrated ‘FaceID’.The consequences of which aren’t limited to just Apple or the rich and powerful. Face ID is a new and upcoming tool in the field of technology. 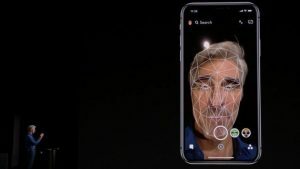 According to Apple, it provides intuitive and secure authentication enabled by the state-of-art TrueDepth camera system with advanced technologies to accurately map the geometry of your face. Apple isn’t the first company to come forward with this idea but certainly the brand name warrants for excitement and attention towards the project. The TrueDepth cam of the iPhone X creates a depth map and infrared image of your face by projecting and analyzing over 30000 invisible dots. The A11 Bionic chip is involved in checking matches between the enrolled facial data and the saved one. Face ID’s features such as recognizing faces with scars or even in the darkness are quite attractive indeed. But the question of security still remains. Even though Apple has claimed that the incredibly sophisticated system will take a lot to be fooled, past failures from other manufacturers and comments from security experts seem to disagree. Apple claims that the face data is secure in the phone. But the consequences of this data getting into the hands of the wrong people are terrifying. The fact that the camera is always functioning adds to the list of worries. In a country like India where the introduction of the Aadhaar system raised a lot of ruckus, it is strange that Apple has been able to sneak in with this tech. It is a well-known secret that Governments and social networks like Facebook are monitoring our day-to-day lives. In such circumstances the advent of technology that makes physical data of the user readily available is a threat indeed. Tools like Face ID, through their outward appeal, may creep into people’s lives and lead them into traps. Another big argument against the safety of such tools is that they are not under the complete control of the user. It makes it easy for people looking to steal data as all they have to do is take the person and get his face scanned. This makes Face ID even more vulnerable than the usual pin-code or password locks. Even though Face Detection is a big advancement in the field of technology, it remains a double-edged sword that can strike either way. Technology was developed for the good of mankind. It was intended to make life better while staying in the moral grounds. The security of the people is of utmost importance. We should know that our lives are our own and that we are not just some puppets who can be manipulated easily. So it is up to us to take a stand against injustices to our privacy and security.